Working with a computer, this item performs the functions of a factory VAG-1551 or VAG-1552 scan tool and more. This item is fully compatible with almost all VW/AUDI/SEAT/SKODA vehicles, including KKL and CAN-BUS. Full support for control modules using the new "Service 22" identification methods. Support for control modules using the new UDS/ODX/ASAM protocol. Control Module ID (including Advanced ID), Coding, Security Access, and Fault Codes. Support for vehicles with dual ECUs, or example the RS4 and W12 engines. Both ECUs are accessible simultaneously via address 31 for Basic Settings such as TBA. Revised Adaptation screen to support the much longer Long Adaptations now appearing in some control modules. Revised Advanced ID screen for increased flexibility handling the various data items appearing in the latest control modules. New internal Gateway Coding Assistant (required for Audi B8 platform cars). All VW, AUDI, SEAT, and SKODA vehicles, includes those with CAN-BUS system. 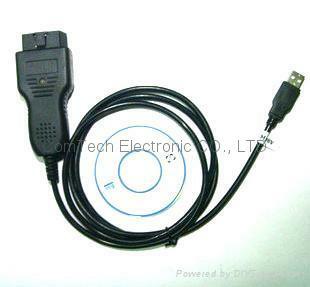 This interface (adapter) is used as an interface and a USB cable to connect a VW/AUDI vehicle to a PC with USB port for on-board diagnostics (OBD).